You must be quick to make money otherwise you might risk an enormous amount on the stock exchange. Special software like Stock Calculator can help determine profit and loss. Calculation: Stock Calculator has been designed to offer assistance in calculating profits and loss of a business. It consists of specific fields where to enter stocks, outcomes and price of each unit and the software automatically displays the balance. Compatibility: this version of Stock Calculator appears to be very interesting. Indeed, its developers thought about designing it so as to be compatible both with computers which have Intel and PPC processors. Multiple processes: apart from what we mentioned above, Stock Calculator also offers the ability to perform multiple calculation processes at once. Indeed, it is allowed to open several calculation windows simultaneously without slowing down the computer's performance. 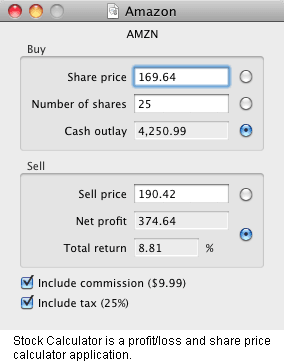 Stock Calculator is compatible with all Mac OS X platforms whatever their release. It has a simple interface and is easy to handle. Latest update on May 5, 2015 at 02:50 AM.